I had the honor to attend a new (for me) conference: The spring meeting of the German Unix User Group, this time hosted by the Cybersecurity department of the Darmstadt Technical University. The conference had about 115 participants and orients itself mostly towards admins. The former emphasis on Unix is long gone, all talks except one (about Solaris) where about Linux and Linux-based technologies. Two days of tutorials where followed by 2 days of talks in 2 parallel tracks. Noteworthy talks where the keynote about Jailbreaking WiFi Firmware by Matthias Schulz, Architecture Pattern for Container and Kubernetes by Thomas Fricke and several talks about software defined storage. Especially the ensuing discussion between the speakers representing competing approaches helped many attendees to sharpen their own opinions. Impressive walk-through of the effort it took to turn Broadcom Wifi chips into WiFi monitors suitable for WiFi hacking. The code is available on seemoo-lab/nexmon and backs the Nexmon Android app which turns a Nexus 5 or Nexus 6P into a WiFi hacking tool. Besides hacking custom WiFi firmwares enable useful applications, for example adaptive video quality streaming over WiFi so that nearby clients receive a higher quality video signal while far off clients - that have a lower WiFi signal rate - still receive a lower quality video signal. See APP and PHY in Harmony. 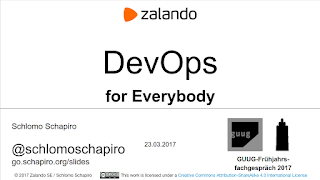 My own contribution was a new talk DevOps for Everybody - How the entire company can benefit from DevOps about bringing DevOps ideas to all employees in the company. The main idea is to see DevOps as a technique to use technology to change culture. Together with the talk I also presented a paper A Workplace Strategy for the Digital Age which can serve as an IT strategy for corporate IT departments that want to apply my ideas.